Subcon is the UK’s premier manufacturing supply chain show dedicated to subcontract and outsourced engineering services. This is the must attend event for subcontract manufacturing buyers from all industry sectors, to source suppliers, benchmark capabilities, and secure contracts in order to remain competitive in a global market. Subcon is the focus for manufacturing procurement teams from both OEMs and tiered suppliers to benchmark subcontracting capacity and capabilities in order to refine their supply chain. Benefit from being part of a wider manufacturing event – 500 suppliers under one roof. This year, Fabtech will be held from June 6 to 8, 2016 at the NEC Hall 3, North Avenue, Birmingham. 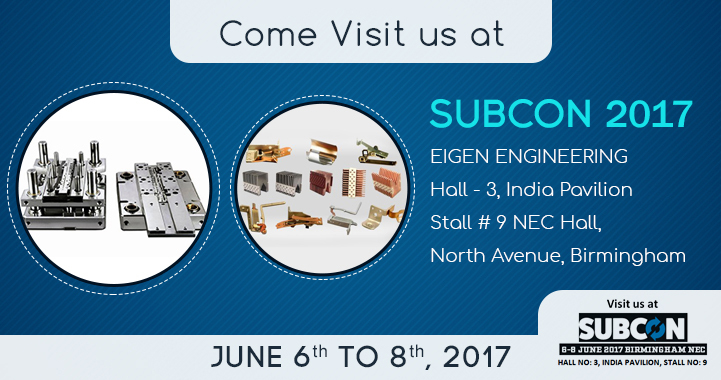 Plan to stop by Hall # 3 India Pavilion, Stall # 9 to find out more about Progressive Tooling , Precision Metal Stamping , and Plastic Injection Molding & Plating for your company.